Everyone knows about Angkor Wat of Cambodia and how famous it is. 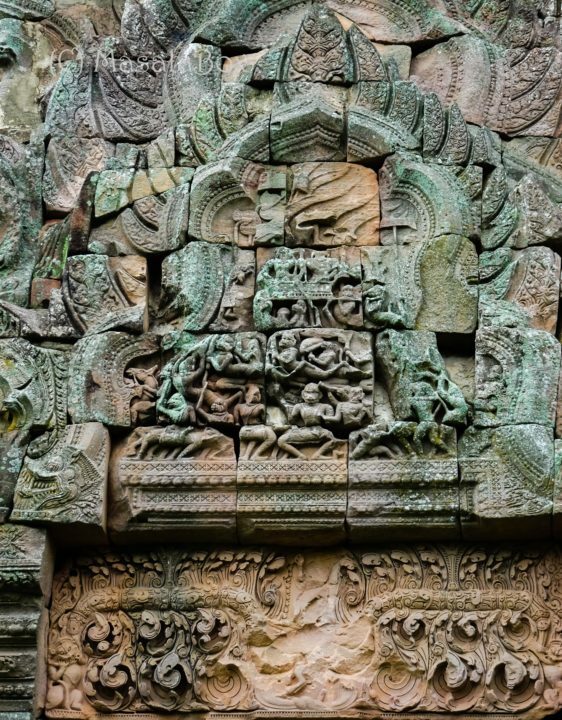 Angkor Wat being the prime legacy of the Khmer empire has stolen away all the limelight. So much that the rest of the Khmer temples don’t even get a mention and are often forgotten about. Khmer empire runs over most of Thailand and therefore we get to see many Khmer temples around Thailand too. The prominent ones however lie on the ancient Khmer Highway. 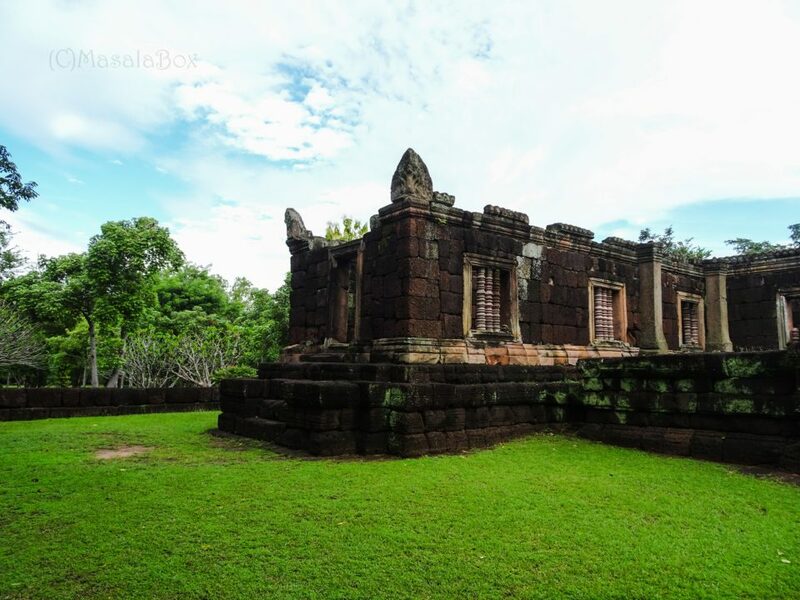 One such is the Prasat Hin Phanom Rung popularly called as the Phanom Rung historical park. This was the first historical park that I visited in Thailand and hence it holds a special place in my heart. 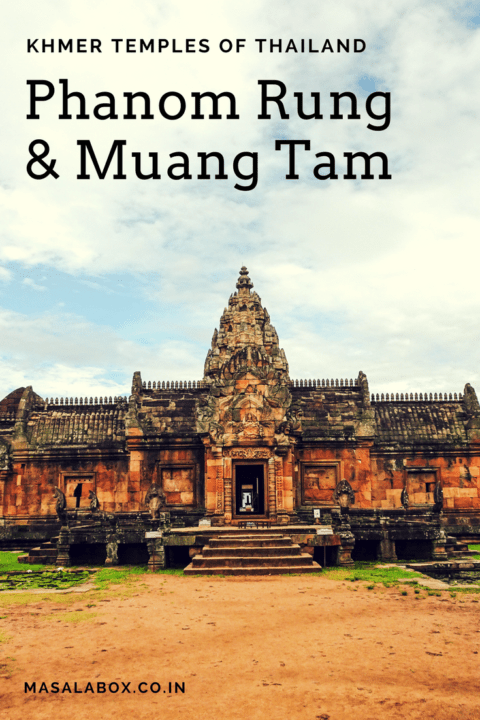 I was majorly impressed with Phanom Rung and also the Prasat Muang Tam found just a few kilometers from Phanom Rung. Contents - Read all the way though. 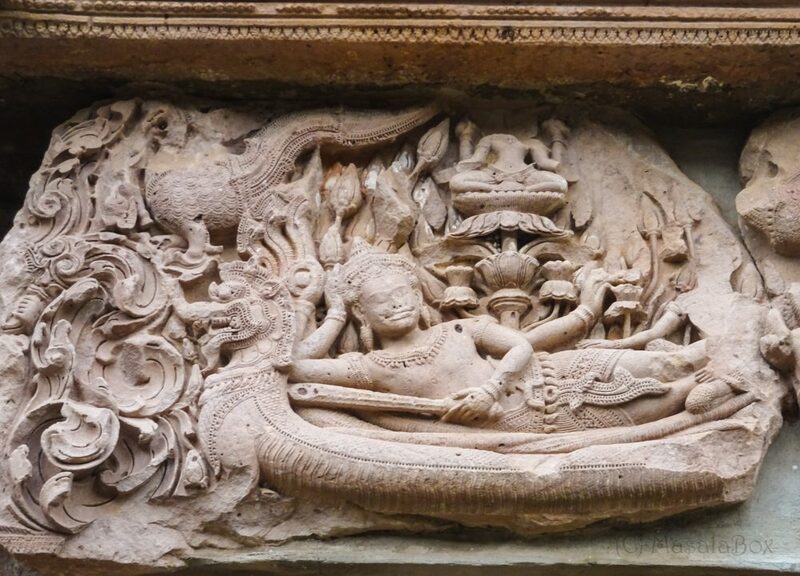 Khmer empire is popularly known as the Angkor empire, hence a lot of people think that only Cambodia was under them. However, their empire was wide spread to Thailand, Laos and parts of Myanmar, Vietnam too. In fact we can see Khmer temples as far as in the west at Kanchanaburi, Thailand. 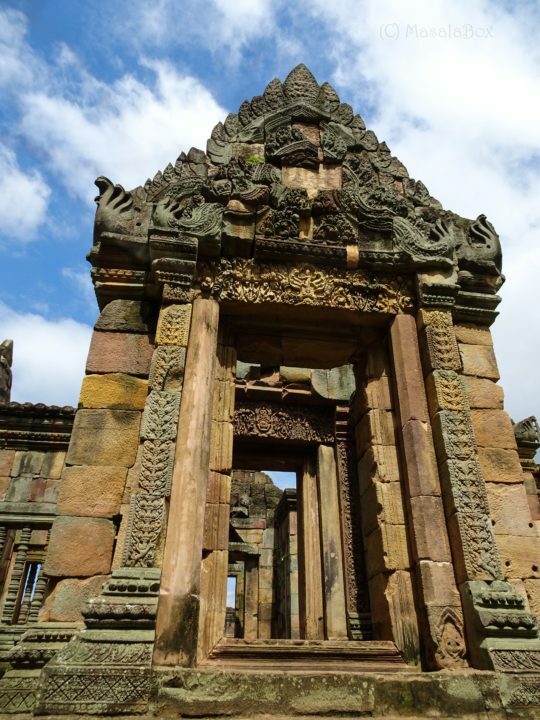 But they had their base at Angkor and had many prominent temples constructed around the capital that the other temples did not get their due credit. If we read the history of Khmer dynasty it is quite interesting. 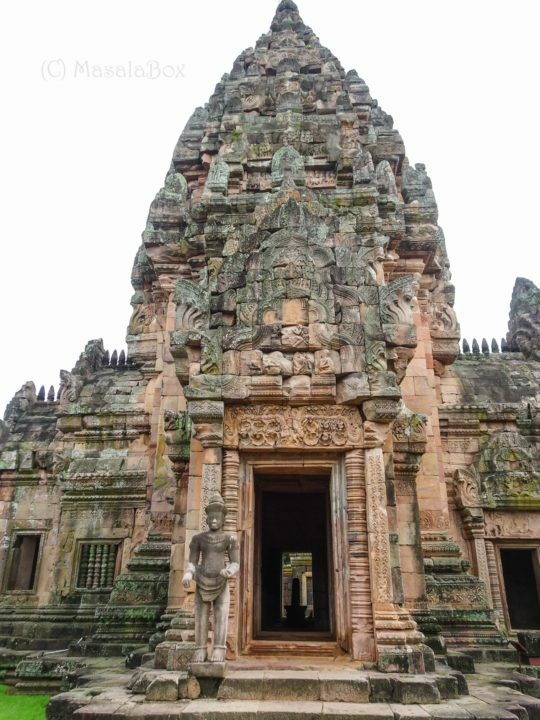 Khmer kings oscillated between Hinduism and Buddhism, leading to construction of both kind of temples and demolishing them in their respective periods. Angkor was found by Jayavarman II who was a Hindu. He and some of the subsequent kings were also Hindus but the drift was from being Vaishnavite to Shivaite. 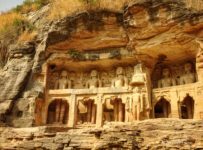 So we can see Vishnu temples and then Shiva temples or sometimes Shiva temples with all Vishnu motifs. In fact it is fascinating to read that the Khmer kings made alliance with the Chola dynasty of South India just because both were strong Shivaites. 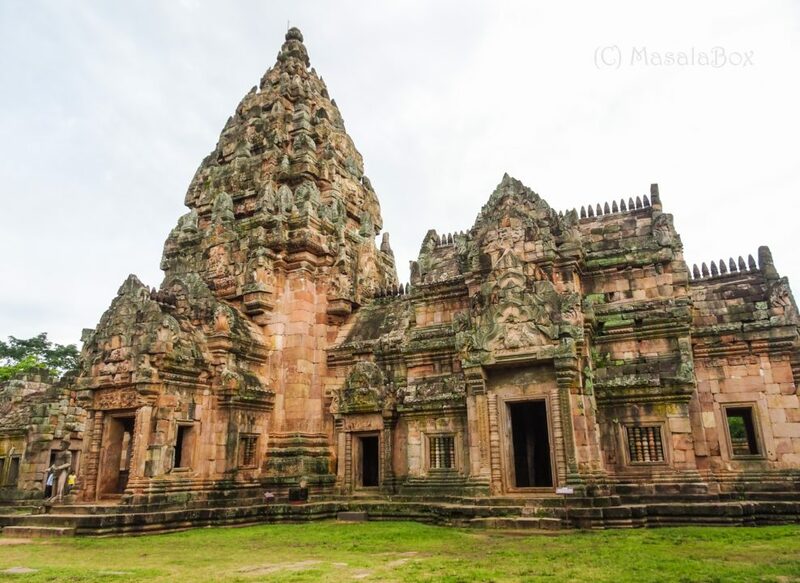 Phanom Rung was constructed by Suryavarman II who was a Shiva devotee and hence the main deity of temple is Shiva. 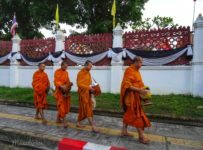 Subsequent kings started to adopt Buddhism in its different forms, leading to Hindu temples being converted to Buddhist ones or they were being demolished. 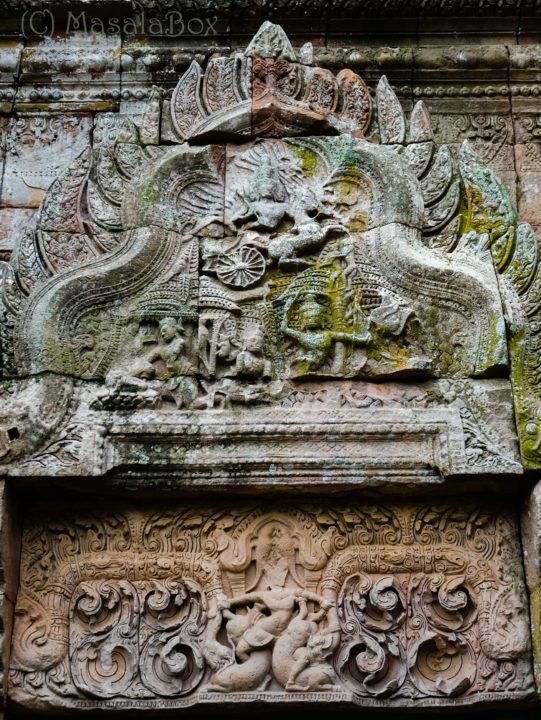 Hence even now one can see some of the ancient sites of Thailand having lintel and motifs of Hindu Gods but the primary deity will be Buddha. One of the prominent kings of Khmer empire is Jayavarman VII, known for improving the infrastructure of Angkor and constructing many architecturally rich temples like Bayon. He constructed the ancient Khmer Highway which was a 225km road running from Angkor (current Cambodia) to Phimai (current Thailand). 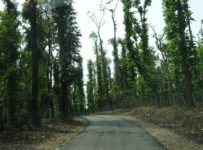 This road which is also known as the Royal Road and sometimes referred as Dharamsala road was economically developed with many temples, hospitals, schools constructed along the way. Phanom Rung, Muang Tam and Phimai falls in this highway, making it an important site to visit and thereby it survived even after the Khmer empire was overthrown. 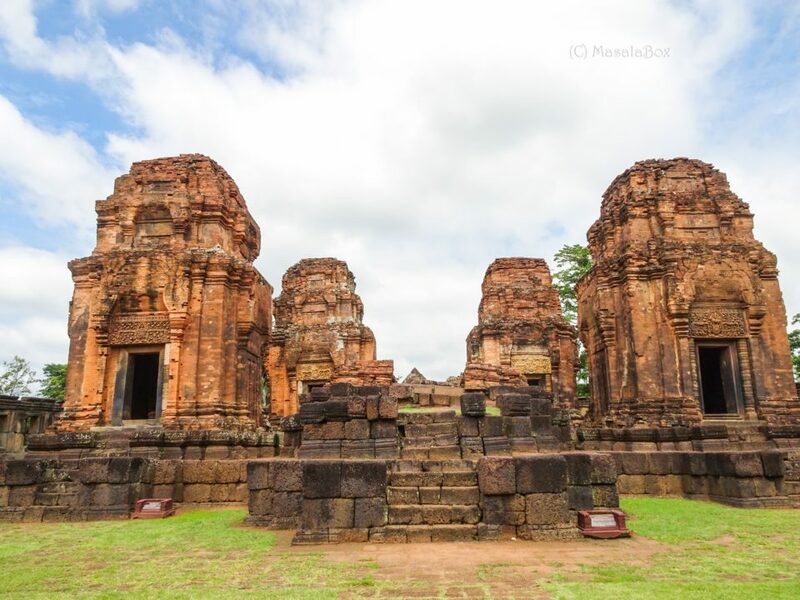 These temples are from 13th century which is even before the Thai kingdom came into establishment. 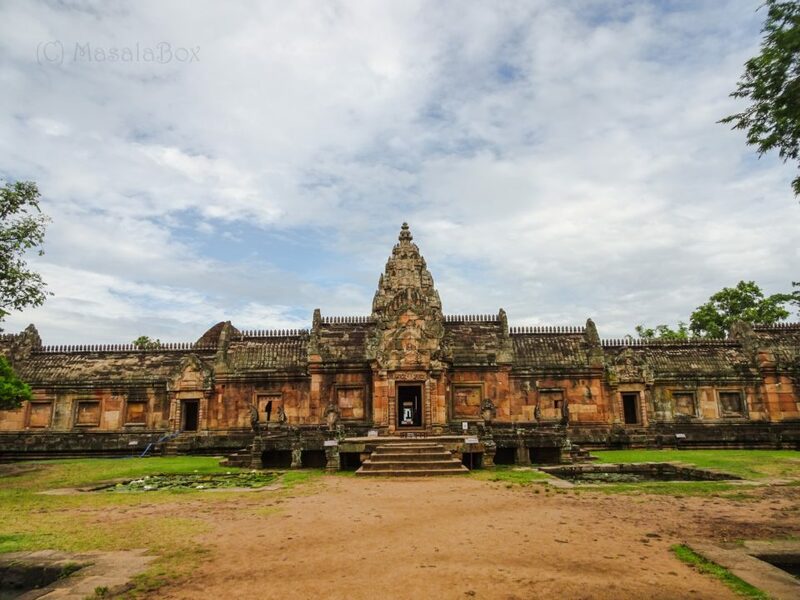 As mentioned before, Phanom Rung is a Shiva temple constructed by Suryavarman II. 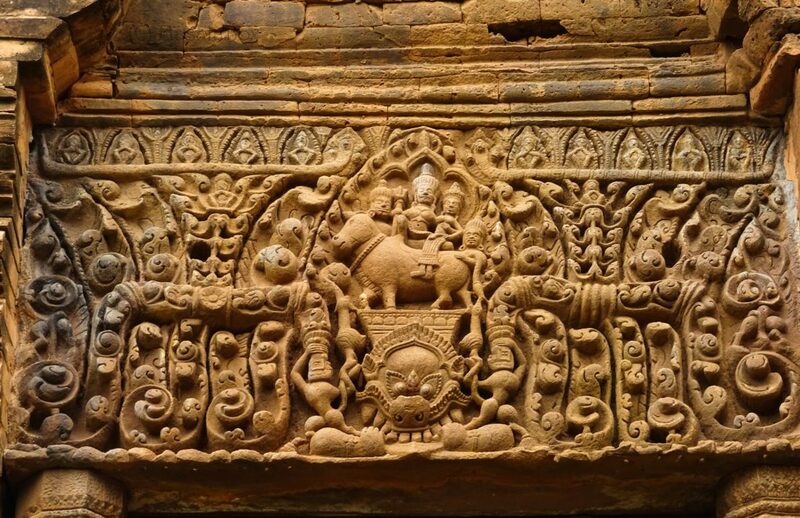 This comes from an era where Khmer kings were Hindus. Which also means these temples are older than Angkor Wat. 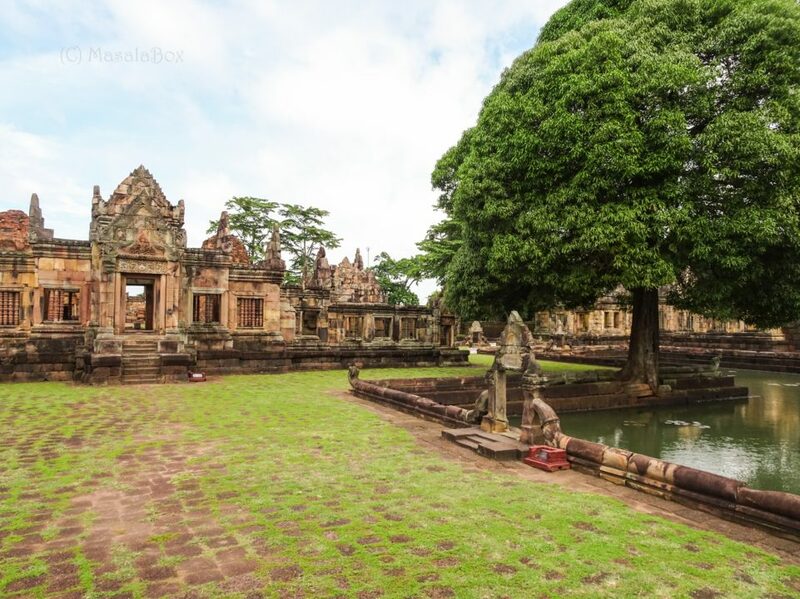 Phanom Rung history also states that Angkor Wat was built from the inspiration of this temple. Situated up a hill, it is on top of an extinct volcano. The hill represents Mount Kailash which is the adobe of Lord Shiva. Now you know the significance of the temple, it is as great as taking blessings from Shiva in his adobe. I had hired a car to show me around Phanom Rung, Muang Tam and also Khao Phra Anghkon, a relatively newer temple. The east of Thailand has its own charm like a normal town, untouched by the tourists. Residential houses flanked on either side, petty shops and small grocery shops tucked in the corners, street vendors selling fruits.. Drive away from the town opens up to lush paddy fields on either side, tiled farm houses tucked here and there, bullock carts in front of the houses, cows lazing in the front, hen and chicks running around.. 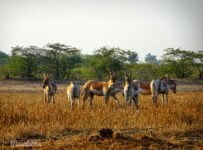 It pretty much felt like I was going on a road trip a little away from cities of India into its villages. The roads went winding up a hill and led to Prasat Hin Phanom Rung. I was there by about 9am in the morning and was surprised to see the restaurants grilling fish and pork so early in the morning. The shops in front of the temple were yet to open. Got a ticket that lets you visit Muang Tam as well and walked up the stairway from information center. Wonder why they make such steep stairways, especially those days when the kings and queens would have probably been carried in a palanquin. 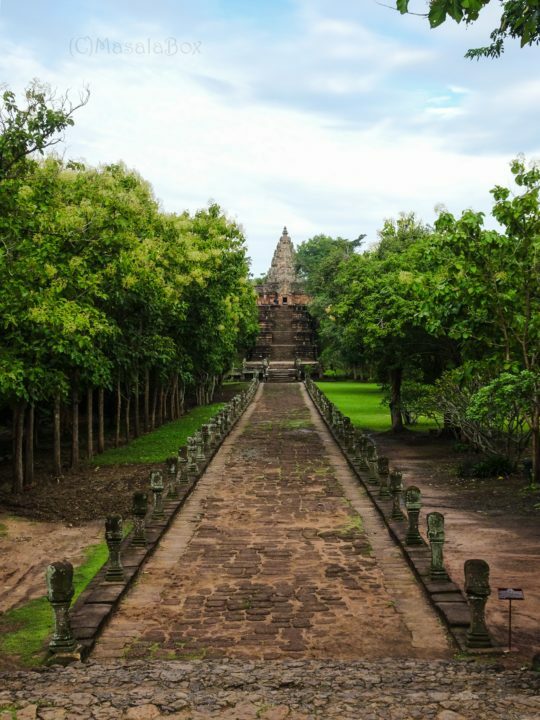 Walking up the stairway, there comes the first sight of Phanom Rung at a distance. 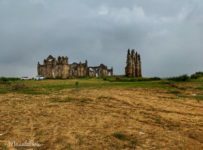 The blue sky, the earthy tones of sand stone structure, green trees, the temple atop; indeed it was like Kailasam the perfect adobe for Shiva. To the right were rooms that were used by the royalty to change costumes before entering the temple. Called the Royal Pavilion, it itself looked a beautiful architecture, especially the windows. It must have had a wooden tiled roof for it is no longer there. 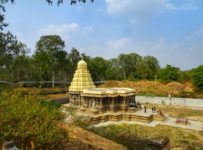 Thankfully the prominent temples are constructed in stone! 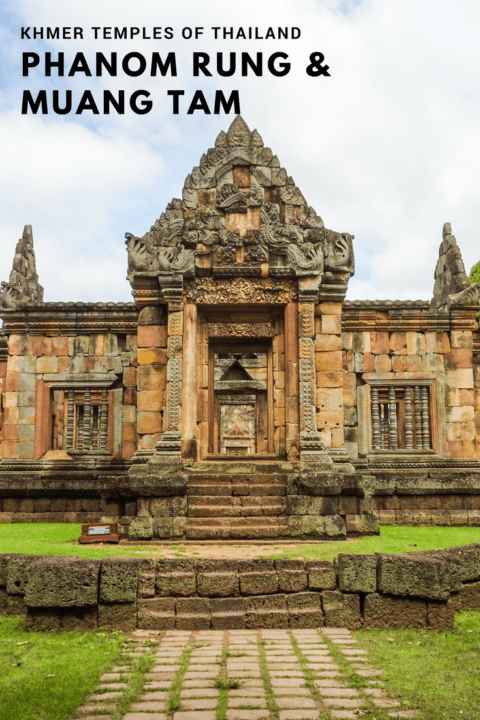 It is said that lot of buildings during the Khmer period were made of wood and hence was easy to get destroyed in fire. A steep set of stairs peered at me. I imagined the royalty wearing colorful clothes walking through these stairs. And Thai costumes are so beautiful. In fact this wish of mine was fulfilled in Phimai, I will write about it in the next blog. 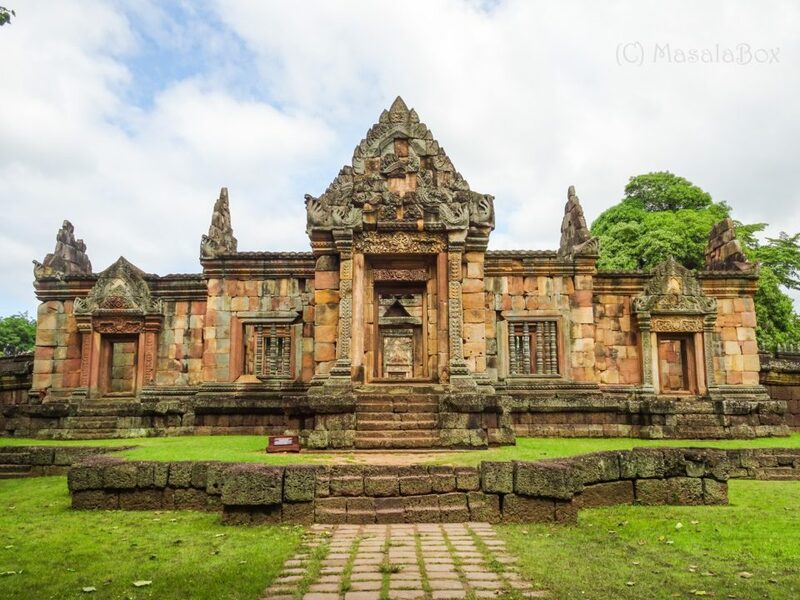 Khmer architecture of temples is heavily influenced by the Indian temple architecture. 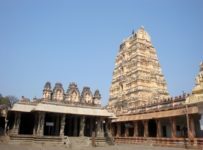 These temples have a pavilion like mentioned above. A main entrance facing east with a gopuram towering above the entrance. 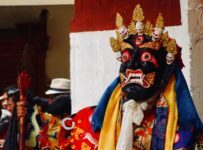 And then there is an enclosure which usually has the temple pond, kitchen, dharamsala (for travelers to rest), a library (to stock the religious scriptures), dancing hall, smaller shrines around the enclosure and the main sanctum where the primary deity will preside. And then we get to see lot of deities, guardian angels, demons in the form of motifs on the gopuram and pillars. 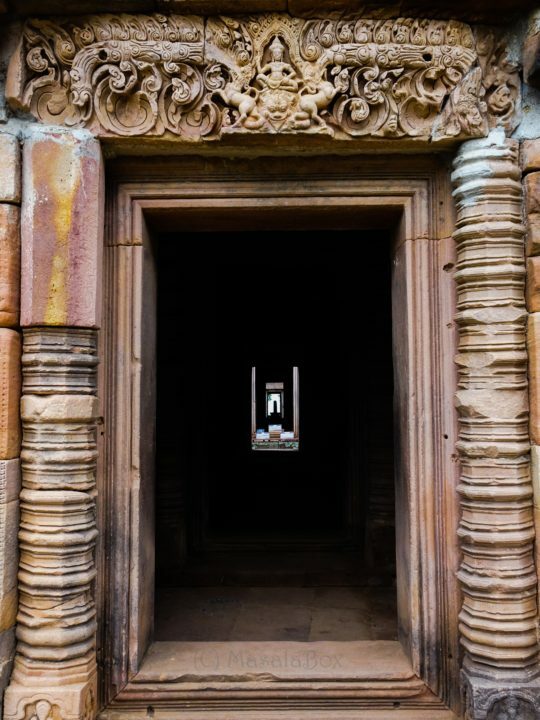 Some of the differences we can find are, Khmer architects were not perfect with making arches for doorways. So what they did was to raise two pillars and place a carved highly decorated stone over it, these are called lintels. The problem with lintels is, since they are a separate piece from the pillars, it remained as a source of theft. The other is the prominent Naga bridges connecting walkway to the main temple. The other thing I love about Khmers is the way they make faces of idols and sculptures. Be it Buddha or Vishnu, they will have a square face with eyebrows joined. Even before you enter the temple, one can still see the Shiva Linga from the entrance itself. The temple has four doors and from all the directions one can see the Shiva Lingam. What fascinates me are the stories from Mahabharatha and Ramayana on the lintels and walls. 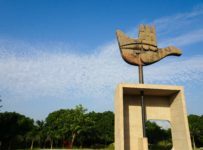 The main entrance has the sculpture of Dakshinamurthy on top – the representation of Lord Shiva as the supreme Guru of all kinds of knowledge. 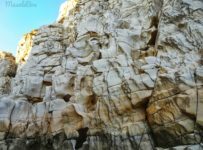 Most of the lintels and figurines are described as what is what, making it easy for the tourists to understand. Am going to let the pictures speak from here.. This lintel depicts Rama’s army getting ready for the war. On the top you can see Rama and Lakshmana being carried on a palanquin. The most famous lintel of Phanom Rung, showing Vishnu in the Ananthasayanam form.. Meaning He is sleeping with Adhiseshan guarding Him and Goddess Lakshmi by His side.. In Thai this posture is called Thap Lang Narai Banthomsin. 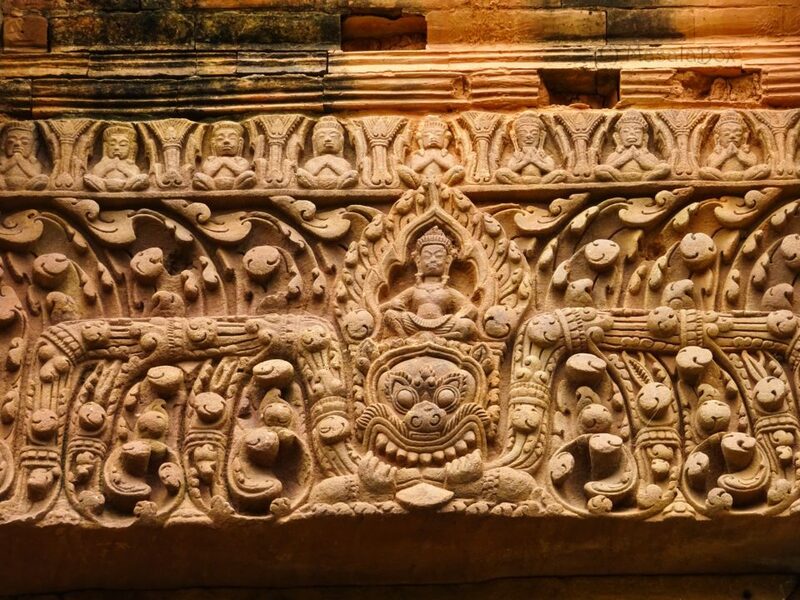 This lintel is famous because it was once stolen and then was found in the museum of Chicago and then Thai made a donation to the museum to procure it back to where it rightfully belongs. Below we can see a picture of this lintel. The head of Lord Brahma is missing and we can see the hand of Goddess Lakshmi near His feet. Phra Narai Lintel – Vishnu in Ananthasayanam form. 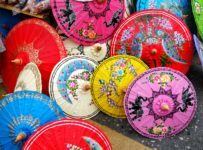 It is a popular festival that happens every year early April. The date changes every year and you need to check out before. It is the day when the sun aligns through all the 15 doors of the temple. Architectural wonder! Yes! The sunrise perfectly aligns through all the doors making it a spectacle to watch. I was not there during the festival time but having read about it, am sure it will be crowded. But one cannot miss all the colorful Thai procession and dance performances that happen there during the festival. 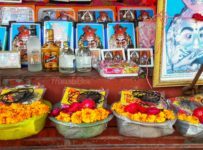 Found right at the foot of the hill is the Muang Tam temple dedicated again to Lord Shiva. This temple is much well maintained and the lintels and motifs seem to be in better shape. With similar architecture, what captures my eyes are the lintels depicting scenes. 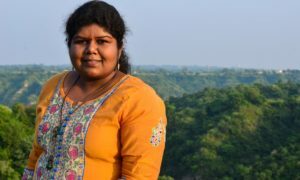 Particularly the one that reads KalyanaSundaraMurthy – Tamilians will find it very familiar to read. That is the form of Shiva where He is about to marry Goddess Parvathy. The usual depiction is the Lord accepting the hand of Bride which Lord Vishnu gives away. Here we can see them sitting on Nandi, the vehicle of Lord Shiva. The picture of this lintel can be found at the top of this post. I loved Muang Tam more than Phanom Rung, may be because it was much quiet, serene and well maintained. Pictures from Muang Tam..
With time in my hand I decided to visit one more popular site nearby called Wat Khao Phra Anghkhan. 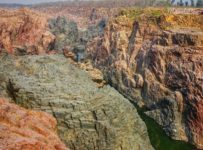 It is about 20 odd kilometers from Phanom Rung. 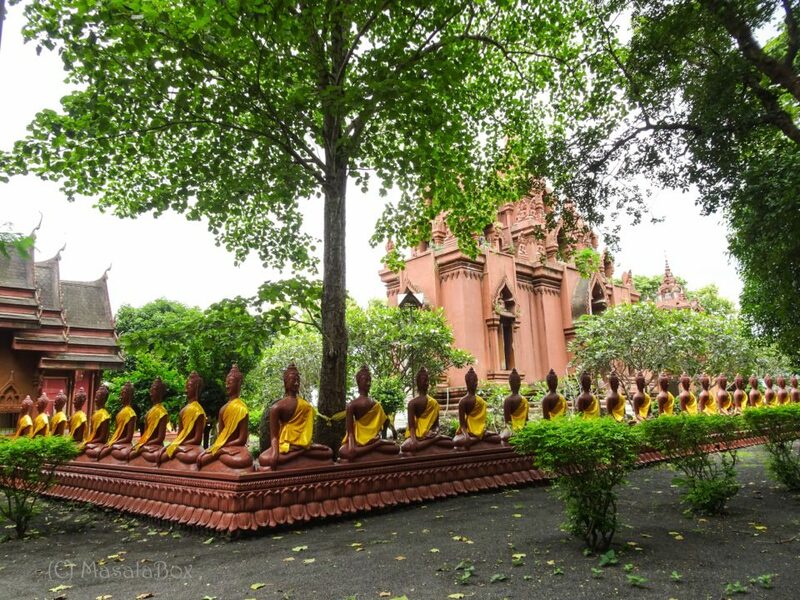 It is relatively new, showing different styles from Chinese pagodas to Khmer style structures. 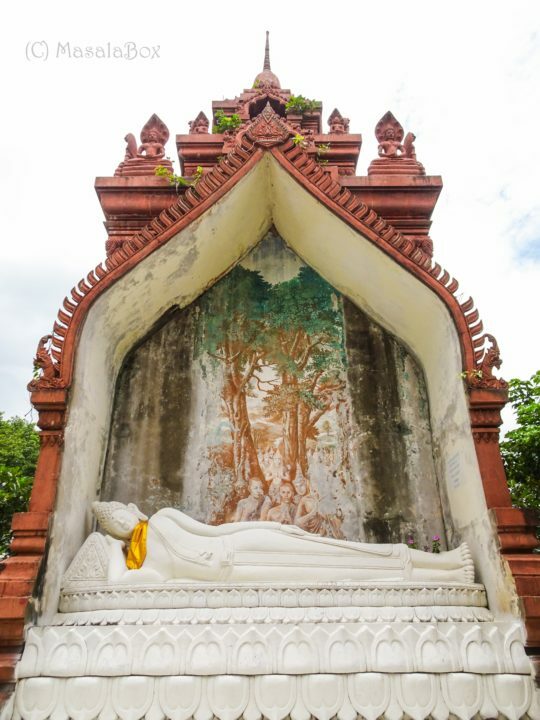 A Reclining Buddha is the first sight to see. It is huge but it is not the best that I have seen. 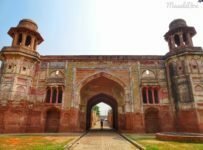 The main inner building has lot of wall murals depicting a story of an honest king and his sufferings on one side of the wall. And on other side is the life of Buddha. What caught my eyes was a beautiful reclining Buddha behind the main building with such a serene face. There are no places to stay around Phanom Rung. You can either stay at Buri Ram which is about 60km away or at Nang Rong which is just 30km away. 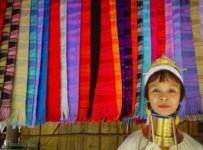 I stayed at Nang rong which is relatively a small town and not with many good stay options. Initial thought was to hire two wheeler from Honey Inn guesthouse. Honestly, the town is so small that we could not find anyone renting two wheelers / bikes, not even the hotel that I was staying in. Some blog pointed me to Honey Inn and we walked and walked to find that place. But instead we hired a car so that we can cover more sites and the owner of the guest house surprisingly had a good command over English language. 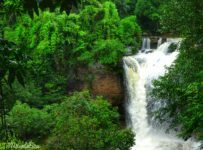 What you can also do is stay at city like Ratchasima and do a day trip to Phanom rung. If you have plans to do Lopburi and Phimai then Ratchasima is like a center point..
That is a great read. I love all the pictures used in the article.